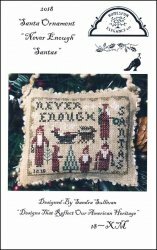 2018 Santa Ornament: Never Enough Santas [C7246] - $7.50 : Yarn Tree, Your wholesale source for cross stitch supplies. Cross stitch pattern by Homespun Elegance. There can "Never Be Enough Santas"! These Santa's are busy at work with getting everything ready for Christmas. One Santa is picking out a Christmas tree, meanwhile another Santa is decorating a Christmas tree. While one Santa is in charge of hanging the Christmas wreath, the other Santa is dashing on his way to go deliver the Christmas gifts. I mean...Santa can't be all in one place at once, can he?!?! Stitch count is 59w x 46h.